My first visit to the Hawaiian Islands: Oahu, Maui, and Hawaii; two weeks, May–June 2005; Sue, me, and Dough Boy. Blame Bob. He was the one who suggested we visit Leonard’s Bakery in Honolulu. Leonard’s is famous for its hot, fresh malasadas, basically Portuguese donuts. Simply sprinkled with sugar or cinnamon, or filled with coconut, guava, custard, or chocolate cream, they were the most moist, delectable donuts I’ve ever had. I wanted to bring back something to thank Bob for his tasty tip, as we never would have discovered Leonard’s on our own. That’s where Dough Boy came in: a plush malasada with little arms and legs, a striped chef’s hat, wide eyes, and a merry smile. We bought him for Bob, but he became sort of a trip mascot and “travel buddy.” The cheery little fella started turning up in photo after photo. Dough Boy on the beach at Waikiki, Diamond Head behind him. 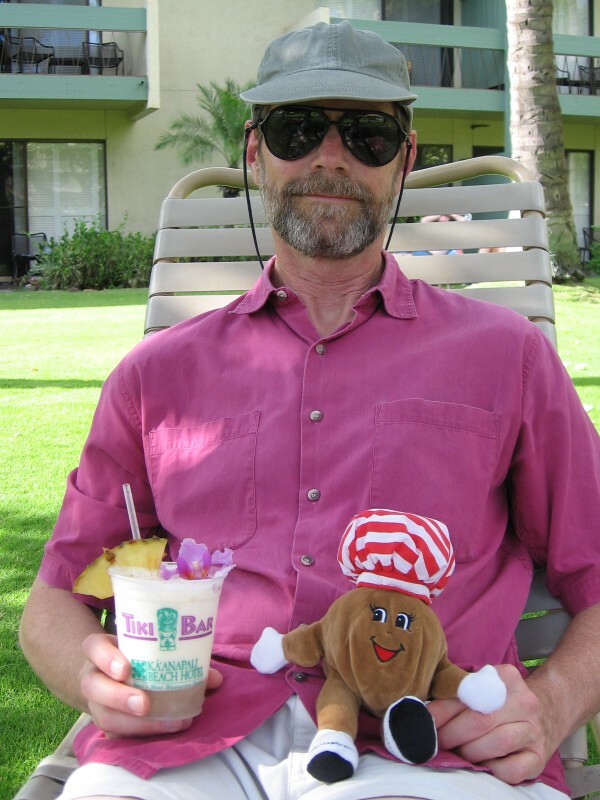 Dough Boy and me relaxing with a piña colada on Maui. Dough Boy atop Kilauea volcano. The donut was out of the bag. But here, let me show you…. Let’s see, here’s Sue and me at our hotel in Waikiki, bedecked in purple leis, bleary-eyed after 14 hours of travel across six time zones. We stayed in Waikiki for four days and mostly walked or took city buses to get around. Honolulu has a great bus system, easy to use, frequent, and inexpensive. The chatty bus driver who drove us to Pearl Harbor gave a nonstop running commentary on the sights along the way. We rented a car only one day, to drive over Pali Pass and up to the North Shore for shave ice–basically snow cones with a huge and colorful selection of fruit-flavored syrups–at legendary Matsumotos. That’s the day we acquired Dough Boy. Here’s our first picture of him, sitting behind a box of malasadas. Scrumptious as they were hot and fresh, after a day in a car trunk and a night in a refrigerator, they had lost their creamy texture and were now just wrinkly, soggy old donuts. Buy them fresh and eat them right away. Here’s Dough Boy with a yellow plumeria blossom beside his chubby cheek. Plumeria blossoms are what our leis were made from. The grow on pretty little shade trees you see everywhere on Hawaii. We missed attending a lei-making demonstration one morning at the Ka’anapali Beach Resort on Maui, honored as Hawaii’s “most Hawaiian resort” and known for its cultural programs. Instead, we wasted our time at one of those “free breakfasts” you get with hotel package deals and that turn out to be sales pitches for commercial tours and shows and other stuff. We did attend a pineapple-cutting demonstration, where we learned several ways to slice and serve sweet Maui gold pineapples–and then got to eat the results. Here’s the Doughster lounging on a bunch of green bananas still on the stalk. That was on the grounds at the Ka’anapali Beach Resort. Instead of fancy pools and water slides like the pricier resorts along Maui’s posh Ka’anapali coast, ours had lush, lovely, quiet grounds well suited to just relaxing. (Sue likened the ambience to that of a sanatorium.) Tiki torches burned at night, as we sat out on our private little lanai (that’s a porch) and listened to Rudy Aquino and his band playing Hawaiian tunes and pop favorites near the open-air restaurant and tiki bar. Everything’s open-air in Hawaii. Speaking of which, here’s the three of us at Aloha Mixed Plate, a restaurant in Lahaina on Maui. We had two of our most authentically Hawaiian meals here on a lanai overlooking the ocean. Their shoyu chicken is so tender it practically melts in your mouth. The inexpensive tab was the icing on the donut. Let’s see, Haleakala, Haleakala, scads of shots of Haleakala crater atop Maui’s biggest mountain. Lots of people come to see the sunrise and then bike all the way down the mountain. We went at midday just for the view. Dough Boy didn’t like it; it was cold up there at 10,000 feet. (Good thing he had mittens.) On our way up, we alerted a National Park Service ranger to a guy suspiciously hanging around a trailhead parking lot. After that we made sure we never left anything valuable in the car. Here’s Dough Boy and me on our lanai at Hana Maui Kai Resort in Hana, with a bottle of golden pineapple wine from Maui’s Tedeschi Winery. Down below is a black sand beach. The islands also have white sand, red sand, even a green sand beach. And all those too-colorful-to-be-real tropical plants you see in garden stores back home? They grow wild everywhere in Hawaii. By the way, do yourself a favor before you go, and read a bit about Hawaii’s history and culture, flora and fauna, and geology. Learn why everything seems to be named after King Kamehameha (Hawaii’s George Washington, sort of), and what those otterlike critters slinking around all over the Big Island are (mongooses). It’s fun to know what you’re seeing when you come across an umbrella-shaped monkeypod tree, or a rainbow eucalyptus, with its garishly colored bark, or the multi-trunked banyan tree, an exotic from the Land of Oz. And learn a little Hawaiian, starting with “aloha” (greetings and farewell, and the Hawaiian spirit of generosity and love) and “mahalo” (thank you). Find out why all the condominiums seem to be named “Kai” this or “Hale” that (“sea” and “home”). And learn how to say Hawaiian words, so you don’t sound like a hapless “haole” (someone who can’t pronounce Kamehameha). It comes in handy when you want to ask if Pu`uhonua o Honaunau National Historical Park on Hawaii is worth the detour (it is). Here’s me and D.B. at yet another open air bar, this one at the Outrigger Keauhou Beach Resort on Hawaii. As I sipped from that tall, pink tropical drink with the long bamboo backscratcher sticking out of it (go figure), we watched sea turtles and tropical fish swimming around in the tide pool beside us. What a place; great service too. When we inquired about changing our second-floor “garden” (that is, “rooftop utility”) view room, they upgraded us at no cost to a top-floor, palm-tree-and-ocean view. The Big Island is a donut of a different flavor. The adolescent of the Hawaiian family, Hawaii is the most diverse of the islands and is strikingly different from, say, lush old Oahu, with its dramatically eroded mountains and sugary beaches. Hawaii features gentle slopes; steaming craters; stark, dark, doughy fields of hardened lava; and red-hot lava flows leaking from the overstuffed oven of Kilauea. You can burn your hands on some of the rock on Kilauea, it’s so fresh. Dough Boy liked it there. We stayed in a private B&B cottage in the rain-forested village of Volcano, a place where the old adage, “If you don’t like the weather, wait five minutes and it will change,” is literally true. In the time it took me to apply sunscreen one morning, the sky changed from clear and blue to gray and drizzly. Here’s some pretty coast shots, but I can’t for the life of me recall exactly where I took them. Which brings me to what may be the central point here: Don’t just take pretty pictures; take memorable ones. I have a weakness for scenery, but my favorite shots often end up being of people or details or, well, donuts. That one of me drinking from a pineapple at the Royal Hawaiian’s beachside bar brings me right back to that moment in Waikiki. It says way more than all my carefully composed pictures of Diamond Head taken in the wrong light. Sue spooning sorbet from a coconut recalls that breezy evening in the open-air restaurant near Kailua-Kona. Even goofy pictures, like someone (okay, it was me) posing as a ukulele-playing pineapple at the Dole Pineapple Plantation, will someday mean more than a boring picture of Maui’s Iao Needle rock formation, or that baker’s dozen shots of sea cliffs and azure waters whose location you will forget by the time you download your pictures. Thing is, these pictures help in recalling and relating telling moments or details–the plumeria blossoms that powder the lawns everywhere; our wine tastings at the Tedeschi and Volcano wineries, tiny bubbles and all; the afternoons we spent sipping mai tais among coconut palms and plumeria trees. They also leaven the photo-sharing experience, and, of course, they say loads about us. You’ve probably guessed that we got attached to Dough Boy and couldn’t bring ourselves to part with him. Bob graciously accepted an alternate gift, but I did show him the pictures and he loved them. I suspect this may not be Dough Boy’s last adventure. As they say, have donut, will travel. So when I show off my vacation pictures, and you expect to endure an endless procession of sun-glazed white sandy beaches of Hawaii, magma-colored sunsets, and so on, and instead what you get is a lot of Dough Boy, well, as I said, blame Bob. Or thank him.